The Real Estate Division of Land Management Systems serves the agencies of County Government by acquiring and disposing of public ownership interests in land; compiling, maintaining and updating an inventory of the County's interest in property; and assisting with the formulation, presentation and coordination of County property management strategies. The Real Estate Division researches title issues and provides information relating to county owned property to the Public and other agencies. The Real Estate Division reduces the cost of implementing the County’s vision for the future by providing an informed in-house resource for orchestrating and executing necessary changes in property status. 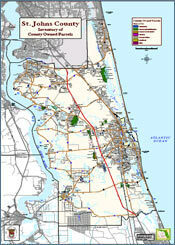 Please click to view a map of the Public lands in St. Johns County. More information on individual parcels and their valuation may be had from the Property Appraiser's website.